Google Custom Search has "google is undefined" error. Where's problem? Is there any problem between IE and Google Custom Search? Why the Google Custom Search has an error with script debugging when i using IE7? 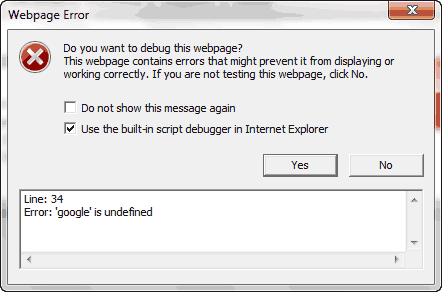 Whenever you go to your pages which s contain of CSE with Internet explorer, you got a script error message. It's really so simple. just add bellow script before other Google Custom Search scripts.